- we added the Bootstrap loading tool directly in a Vault menu; also we provided a default-checked option that automatically download the bootstrap upon launching Vault 3 for the first time was added to the installer. - most of the development work is carried out in Linux environment, we still have to succesfully compile the new codebase Vault in Windows/MacOs environments; this is an important next step. No new major problems have been encountered yet with new codebase, you will see Vault 3.0.0 pop on and off at the blockexplorer as we are testing each new feature. Happy New Year 2018, Bullionaires! 2017 has been a good year for Crypto Bullion, many lingering issues have been resolved. In 2018 Crypto Bullion, perhaps soon to be "Bullion", may be the ideal cryptocurrency for the next big turnaround - May 2018 be the year of the Bullion! I wish all my fellow Bullionaires prosperity, and most importantly, the required health to enjoy it! We are now testing the staking capability, with a live test on the actual CBX blockchain; just a question of time before our Vault 3.0.0 generates a block so we can establish that everything worked as expected. This testing is important and will go on for a few more days. Secondly, we are cleaning up the expected RPC functions, so that all RPC calls to Vault 3.0.0 daemon will respond exactly like for Vault 2.4.3. Also, a few functions of the CBX console were buggy so we are cleaning that up too. Third, from a few days staking experience, we now can tell more precisely that the Vault actually needs 1.1 gig of RAM to run when staking; the important thing is that this amount of RAM is now stable. And that's what we have, for now. 1) After discussing with a few officers from Cryptopia and confirming with them that CBX Vault 3 will not be a swap, we have now 99.5% chance of implementing our desired name change with new logo. I still did not get the final OK however, as we all know Cryptopia's responsiveness has suffered greatly recently. I know my way around with Cryptopia to get things done, just right now they are really swamped. 2) In the previous update, I revealed that we were testing the staking capability of Vault 3; in this test we hit a bug however, our new codebase Vault 3 is somehow infringing one or more rules when attempting to form new blocks, and existing Vault 2.4.3s are rejecting blocks generated by Vault 3. We are conducting extensive tests to find out what rules are being infringed and how to solve this issue. 3) We were able to successfully compile the new Vault 3 code for Windows OS, so this is a major step. 4) Current Vault 2.4.3's loading time has been greatly reduced in Vault 3, using the fastindex function instead of making the Vault extensively recheck things that were checked already, on every launch. Vault 3 launches in under 1 minute now, close to 15 seconds on a SSD drive. That's it for now, enjoy the rest of the week! Hello everyone, I hope winter is going smoothly for all folks from the Northern Hemisphere, and as for the other side of the globe, enjoy your summer at its best! Have you noticed, everytime I post a Roadmap update, I have some really good news, then also something disappointing. I swear I am not doing this on purpose! It's just how life goes in development and coding - certain things go better than expected, then some things which appear trivial at first glance end up being a complicated puzzle. 2) With this achievement in mind, within 2 weeks, we will now be able to finally wrap things up and deliver a functional Vault 3.0.0 alpha; the good news with this version is many current bugs of Vault 2.4.3 will be fixed - so Vault 3 alpha will have all features of current Vault 2.4.3 (minus the bugs) however it will still not contain any code for BPNs yet. This Vault will have the new visual elements and use the new name, "Bullion". 3) About BPNs, which will be our interpretation of masternodes; things are moving ahead BUT as we are clarifying our own unique goals (emphasis on unique), we have come to realize that we have to recode everything. Our masternode system cannot be a simple copy-paste from other projects for a few reasons - one important reason is our concept of "queue" which does not exist anywhere else with PoS. When someone signs up his 2000 CBX for a masternode, he enters a queue to become a BPN. If there are less than 125 BPNs active, his BPN becomes active quickly and starts to earn - if there are more than 125 BPNs, then the inactive BPN goes in a queue and does not earn until one of the 125 disconnects and frees up a spot. 4) New name, new logo: we need a new, more modern Bullion website! So we have purchased a new domain name, and work has started on the design of the new webpage. gatonegro97 has expressed his interest in helping us with this, and his experience in programming will be useful to create something original. Naturally we will put in all useful links on this page; if you have a special idea for this new website, please mention it here. Welcome to gatonegro97 to the team for this project, and hopefully many more after that! Good morning fellow Bullionaires; here is a significant step towards the new CBX network, as we had imagined it a while back. The link to the new codebase Vault 3.0.0 alpha2 is the following: Signup or Login to view earning guides for mobile apps and websites. Important notice: we have been testing internally this new software for two weeks and have not encountered any major issues that would have led us to lose CBX coin, but before you go ahead and use it with your own CBX address it would be important that you backup your wallet.dat file; if you are unsure how to backup that file, please ask. Wallet.dat files should be backed up periodically with all coins, in any case. This public alpha test is the occasion to try out the new codebase and give us feedback, if you see anything that could be improved. You may occasionally find references to non-implemented features in the software, we will correct this as we go. One major thing we have to warn people about this new codebase is that the new Vault is now able to sync organically, which no Vault has been able to do for some time now; syncing organically takes some time however, so this new Vault has an auto-bootstrap feature to speed up this process. The auto-bootstrap feature still has issues with Windows: we are aware of this problem and will be fixed shortly. Since we still have to apply a bootstrap manually if you don't want to sync organically, here is the link to current updated bootstrap: Signup or Login to view earning guides for mobile apps and websites.. This new codebase Vault software is a major step towards our planned roadmap as outlined in the OP of this thread, it does not yet however have the BPN (or masternode) capability. We are still working on our unique approach for CBX masternodes and will have a better idea regarding timing of this development next week. We are also using this new Vault opportunity to gradually modernize/rebrand our image; you will already be able to see the new name and logo for CBX in this new Vault. 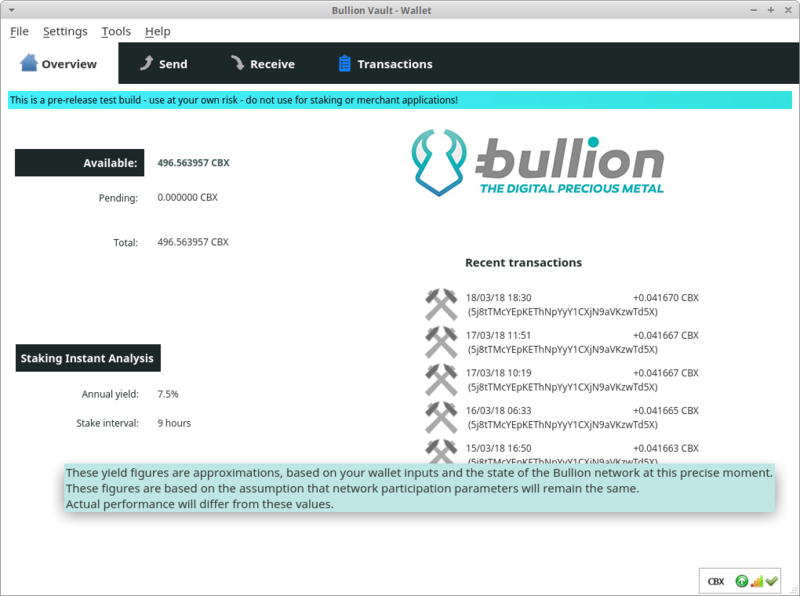 Has anyone noticed that Cryptopia has changed "Crypto Bullion" to the new "Bullion" name already? We have updated the new codebase Vault 3 alpha 2 as well, to "alpha 3". This updated Vault has a few tweaks that bring us closer to final version, with updated PoW signature verification and staking; I recommend those who have installed alpha 2, to now install this one. This alpha 3 also has the same new checkpoints of Vault 2.4.4 that avoid the fork we have experienced a few days ago. Well, sorry, it has been too long since I posted any new article regarding the current state of BPN development; last week was pretty much taken by this unwanted CBX fork situation, to which I think we responded quickly and efficiently - kudos to Alex4J and Malafaya! Hello Bullionaires; here are the latest news regarding how things are progressing in the coding of BPNs. Work was slowed slightly, due to Easter Holiday last weekend, but for this past week and the following ones everything is back on track. - Change block indexation, along with improving blockchain management to avoid some random corruptiosn with our new parameters was very time consuming; but now I can report that this aspect is done also. I will have to add also few security checks to make mutex is even more secure: planning for after, once the BPN will be fully implemented. There it is, a little bit technical, but this is what we are working on at the moment to make BPNs (CBX masternodes) a reality. I wish everybody a good weekend; smile, today is Friday! As promised, here is the report about where development of CBX stands at this moment. This report touches essential 2 aspects of software development: the basic Vault 3.0 code and the BPN coding development. At my last post, I had highlighted the recent issue we had discovered while testing Vault 3.0, the reason for which we needed to compile a new "Alpha 5" version with this issue solved. Well, after some internal testing, it turns out we cannot yet publish the new Alpha 5 Vault for public testing, as we have found more problems that require our attention. This process should not take long as these problems have been clearly identified, so stay tuned for a new Vault 3.0 "alpha 5" in the coming days. Regarding BPN, Alex4J is currently working on the custom, and distinct, difficulty calculation for the BPN block, which is a distinct value, separate from the main blockchain difficulty, and the validation that goes with it. This means that, if the block bpn is validated and authorized at a given time, a BPN queue client is permitted to generate a block and gain the reward. A side note to coding development, we invite all Bullionaires to pay a visit to our new, rebranded, CBX Facebook page. With the new name of CBX, "Bullion", comes a new look and URL for our Facebook page: Signup or Login to view earning guides for mobile apps and websites., please pay us a visit and drop us a line! As part of this "detour", the work going towards releasing this Vault 3.0.0 without BPN will actually not be entirely costing extra time (as these were still necessary coding steps); so work incurred in this detour would have been needed anyways for developing the BPN Vault. Releasing Vault 3.0.0 will naturally come with posting of the opensource code, dutifully published at Github. When launched, Vault 3.0.0 will become the official version, while the upcoming hardfork BPN Vault will be moved to version 3.1.0. Timing wise, we are looking at 2-3 weeks before releasing the new codebase Vault. Thank you for your support, Bullionaires! Fellow Bullionaires, this has been an extremely long and challenging road, but we are indeed getting very close to our goal of becoming a fully operational masternode cryptocurrency. Need we say again that BPN will be implemented in a way that remains unseen in any crypto; CBX will become a masternode coin, but with very different objectives in mind and an innovative solution to make it work, when compared to current mastenode coins. As a reminder, participants will need 2000 CBX to form a BPN (masternode), and there cannot be more than 125 masternodes at any one time - thus ensuring strong passive income for those who commit to invest. CBX maintains its target low 2% inflation. As elambert has mentioned very recently, we are currently internally running a low-level test of Vault 4.0, our implementation of BPN. This test will go on for about 2-3 weeks, and necessary fixes will be applied as we go - but at this point we do not anticipate the same level of hurdles we have dealt with before. What we have left to do is the GUI (user interface) surrounding this new software, as right now the BPN part of Vault 4.0 only runs on console commands. But Bullionaires do not worry, final product will be easy to use and user-friendly! Once we have a tested stable software to run the BPN network, we will allow 2 weeks of notice to all so everybody (including exchanges) have time to update to new software. Naturally, installing this new Vault 4.0 software will be a mandatory update as it will only be this Vault that will have the capability of connecting to and parsing the new CBX blockchain. So we are looking at 4-5 weeks wait until hardfork. More updates to follow soon!